Pro-Nounce, PO Box 1776, Broken Arrow, OK 74013-1776. Allow 3-4 weeks for delivery. 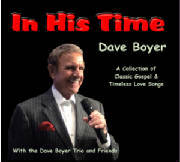 All 7 Dave Boyer CDs for only $77.00 plus postage (a $105 value). This is a perfect opportunity to complete your Dave Boyer collection, or give these CDs as gifts. Click the "Add to Cart" button to purchase the 7-CD set using your credit card through the security of PayPal. Dave Boyer CDs and DVDs available for purchase individually, $15 each plus postage. Click the "Add to Cart" button for each title you want to purchase, then in the shopping cart you'll be able to select additional quantities of each CD/DVD title. Dave's newest album recorded with a small combo. Song titles; All the Way, Cheek to Cheek, Have I Told You Lately, Night & Day, Embraceable You, My Romance, When I Fall In Love, Since Jesus Came Into My Heart, He Looked Beyond My Fault, Get Happy, Guess Who's Coming to Dinner, Wherever He Leads, Room At the Cross. It began as a dream...and now it's reality. Join in this special moment as two memorable performers — Ralph Carmichael and Dave Boyer — step back in time and deliver a masterpiece...THE SWING SESSIONS; songs include: I'm So Glad Jesus Lifted Me, Gaither Medley -Because He Lives, I Lost it All, Get All Excited, Something Beautiful, He Touched Me, He's Been Faithful, Jesus Medley - Only Believe, 'Tis So Sweet to Trust in Jesus, No Not One, Trust and Obey, The Sound of Love, Count Your Blessings, No One Ever Cared for Me Like Jesus, He'll Never Let You Fall, The Savior is Waiting/Calvary Covers it All, I'm So Glad Jesus Lifted Me. Celebrate our country's heritage with favorite patriotic tunes, including: Swingin' On a Star, God Bless the USA, Broadway Medley, Wind Beneath My Wings, Great Land Medley, God Bless America, Love Medley, That's What Friends Are For, Make Someone Happy, Climb Every Mountain, America the Beautiful. All-time Christmas favorites in that unique Dave Boyer style; Mary's Boy Child, What Child is This, Oh Holy NIght, A Cradle in the Shadow of a Cross, Carol of Christmas, Silent Night, What Did You Say Was the Baby's Name, Sleep Holy Child, The Virgin Mary Had a Baby Boy, Nobody Wanted Him, Have You Any Room for Jesus. Enjoy the sounds of this blessed holiday with Dave. Dave Boyer makes the old hymns come alive with exciting freshness. This collection of 20 timeless songs of faith, hope and love is beautifully orchestrated and will bring hours of joy and pleasure; Boardwalk, Once in a Lifetime, That Rainy Day, Calvary Covers It All, Because He Lives, I'd Rather Have Jesus, A Broken Heart I Gave, How Wonderful Thou Art, If I Could Tell You, Put Jesus First In Your Life, I'm Gonna Keep On Singing, The Blood Will Never Lose Its Power, Just Because I Ask, Someone Who Can, All the Time In the World, Bring Back the Spring Time, All My Life, Through It All, This World Is Not My Home, and Get All Excited. 20 Hymns of Faith, Inspiration & Hope; Calvary Covers It All, Savior Like a Shepherd Lead Us, He Touched Me, The Solid Rock, Jesus Paid It All, Leave It There, At The Cross, Near The Cross, Wonderful Peace, How Great Thou Art, Oh How I Love Jesus, Without Him, My Jesus I Love Thee, Precious Lord Take My Hand, Lead Me To Calvary, The Lord's Prayer, Pass My Not, Where the Roses Never Fade, Until Then, and Because He Lives. Recorded with the Ralph Carmichael Orchestra, songs include; He Chose Me, Try Again, I Believe In You, G.H.A. Medley, The Rock, He's There waiting, O' Speak To Me, When I Think Of The Cross, Part Time Applications, and Where There Is Jesus.